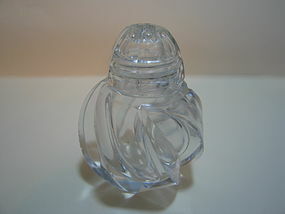 Vintage shaker with 7 holes. It has deep cut vertical swirls. The height with the lid in place is 3 1/4 inches. There is minor roughness to some areas, that can be felt more than seen. I need your zip code to calculate the postage.